This is the era of increasingly rapid change. Teachers are charged with a mission to offer services that respond to technological and societal change. Change implications can be unforeseen. Outcomes to change can result in what can seemingly be unordered and unstructured. Students have to gain the benchmarks and assessable standards as well as gain the foreseeable future skills. How do teaching practices move from a controlled environment to a change focused environment? Society is moving towards continual reinvention. Sharma’s “The Leader who had no title” emphasises that this is the era of leadership influence. What does this mean for teachers, teaching and schools? How should “teacher leadership” impact on our education sector? Should emphasised leadership be made as a processing or innovating change? How can schools manage teachers to reinvent themselves as leaders of change to enable changing environments? How can teachers invent themselves as a progression force rather than the victims inflicted by the insurmountable problems when dealing with change? If the singer Bono can demand "If you are not going to make a difference get out of my way" what can managers of teacher’s demand of teachers who are the victims of change? The implication is that the victim becomes the resistor and ultimately the blocker of change. Teachers who are the victims of change inflict the frustrations onto their students. How many teacher victims does it take in one school to make the school a non performing school? If schools do not make a change what is their purpose? MIT YouTube video "The surprising truth about what motivates us" discusses motivation to meet change. MIT clearly presents the argument that incentive rewards only work with rudimentary skills. Incentives do not work in knowledge based professional occupations and are in fact detrimental to progressing change. Incentives can lead to worst performance. There is a clear argument against the provision of financial rewards for teachers. Teaching is a complex profession that engages conceptual rather than rudimentary skills. Financial rewards aimed at progressing the cognitive focussed profession is detrimental to the profession. They are detrimental to the progression of a school. The Change Management diagram attempts to address the points of view addressed by Sharma and MIT. 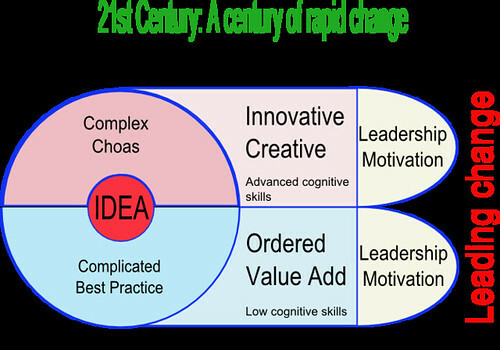 IDEA represents an innovative and or incremental response to change. The change can be focussed towards incremental change that maybe complicated or an advancement of best practises. Change is rudimentary. This is ordered change where a profession employs low cognitive and rudimentary skills. Leadership in this sphere is of a low risk category and follows a clearly stated direction. Change is incremental and slow paced. Motivation strategies to enables complicated and or best practices change can be incentive based. The change can be focussed towards innovative change which may result in complex and even chaotic directions. To enable change that requires complex and or chaotic outcomes requires leadership. Leadership of influence is required. Teachers need to influence creativity and innovation to enable students to grasp the skills of change. Change is fast paced and future focussed. Motivation strategies to enable creativity and innovation are autonomy, mastery and performance. It is time managers of teachers enable leadership that accounts for the complexity and chaotic demands made by change. The teaching profession requires limited rudimentary skills development. The teaching profession requires conceptual skills development. Incremental and ordered change is too slow for this cognitive & conceptual focused profession. Teaching is creative, complex and conceptual. The profession should not be demeaned by rudimentary motivation based incentives. Performance based incentives will not work and may actually inflict poorer standards.